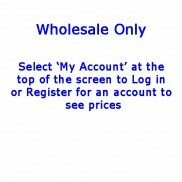 Pack of 6 ceramic hearts in a choice of either red with white spots or light green with white .. 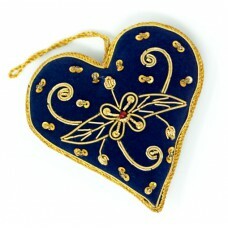 Pack of 6 Zari heart shaped decorations in blue.Details:Zari Hearts - blue (PUZHLB) - 10cm (pack siz.. 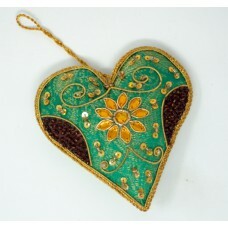 Pack of 6 Zari heart shaped decorations in green.Details:Zari Hearts - green (PUZHLG) - 10cm (pack s.. 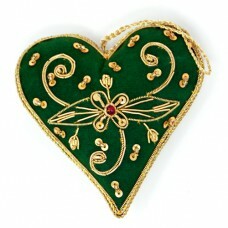 Pack of 6 Zari heart shaped decorations in green and gold.Details:Zari Hearts - green / gold (PUZHLS.. Pack of 12 Cinnamon heart hanging decorations.Details:Heart (MWCDMH) - 8cm x 8cm (pack size 12..